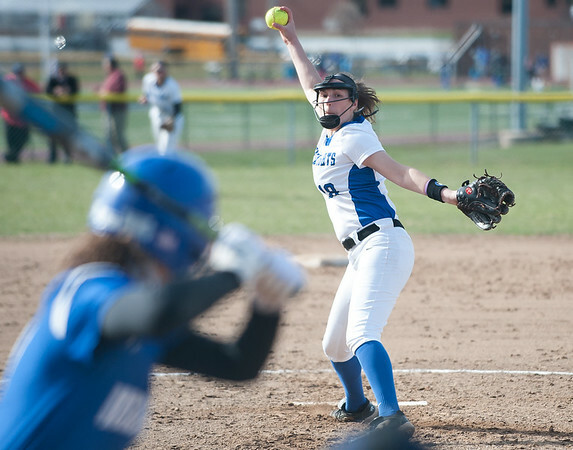 SOUTHINGTON - Southington softball pitcher Kara Zazzaro set the tone right away in Monday’s matchup against Bristol Eastern ace Erin Girard. Zazzaro struck out the side in the first inning and put together a dominant performance both on the mound and at the plate in the Blue Knights’ 6-0 season-opening win against the Lancers. While her performance on the mound was excellent - not allowing a hit until the fifth inning, when Bristol Eastern’s Taylor Keegan ripped a double to right field - Zazzaro also helped herself out at the plate with three RBI. Chrissy Marotto sparked the offense in the first inning with an inside-the-park home run to give the Blue Knights an early advantage. Bristol Eastern didn’t get any opportunities offensively until the third inning. Zazzaro began to struggle with her command at times and the Lancers showed patience at the plate. Lauren Aparo and Riley Giblin drew a pair of walks to begin the third before Lyzah Corliss ripped a liner right at Southington third basemen Callie Gendron. It turned into a double play and erased momentum for the Lancers. With it still just a one run deficit after the top of the third, Southington made its push on Girard, all coming with two outs. Zazzaro laced an RBI single that scored Francesca Ferrante to put the Blue Knights up 2-0. A couple batters later, Girard’s wild pitch advanced Zazzaro to third and Gendron to second. Gabby Malachowski brought both in with a single to put Southington up 4-0. Southington displayed its potent offense against a talented sophomore pitcher in Girard, proving the Blue Knights are once again ready for a strong season. Southington will travel to take on RHAM Wednesday afternoon at 3:45 p.m.
For the Lancers, the game is now in the past and Bristol Eastern will look to win its home opener on Wednesday at 3:45 p.m. against Windsor. Posted in New Britain Herald, Southington on Monday, 9 April 2018 21:04. Updated: Monday, 9 April 2018 21:06.